As the last metal sculpture began to cool in late August, it became official – the 2018 Rosie’s Girls camp season had come to a close! 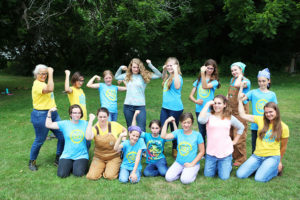 A whirlwind of buzzing saws, whirring sanders, and sparking plasma cutters saw 53 middle school girls and non-binary youth through 5 weeks of camp across northern and central Vermont. Campers went home with personal projects ranging from a folding chair to a candy dispenser made at Build camp, and bike-chain chandeliers to intricate metal roses from Weld camp. I was blown away and inspired by the creativity, perseverance, and dedication our students brought to their time in the shop day after day, even when it was 95 degrees and humid. Reflecting on the summer, I feel a renewed sense of certainty that programs like Rosie’s Girls are essential to growing confident girls and non-binary folks. Those who understand that they can follow their own path in life, regardless of expectations or stereotypes. At camp we emphasize the importance of finding and being a support among peers, and to never be afraid of making mistakes – lessons I hope students will take with them far beyond the camp week. For every student that was apprehensive of using the chop saw on Monday, they stood “ten foot tall” on Friday, proudly exhibiting a homemade dog bed, plant stand, or even hedgehog bunk-beds. For every not-so-sure welder, the same campers would be explaining how the machine worked to their parents by Friday afternoon. To complete a week of Rosie’s Girls is to take a step down the path of self-advocacy, one that says not just “I can do it!”, but “We all can do it!” As the sawdust settles, I already look forward to welcoming back campers next year and learning what they’ve accomplished throughout the school year using their newfound confidence and bravery from the summer.